Students at the University of Puerto Rico service one of the recording devices, or hydrophones. Image: Rebecca Becicka, University of Puerto Rico. What does a hurricane sound like from underwater? Researchers may soon find out after recovering listening devices they had planted off the coast of Puerto Rico in a test that could lead to year-round underwater monitoring of the Great Lakes. 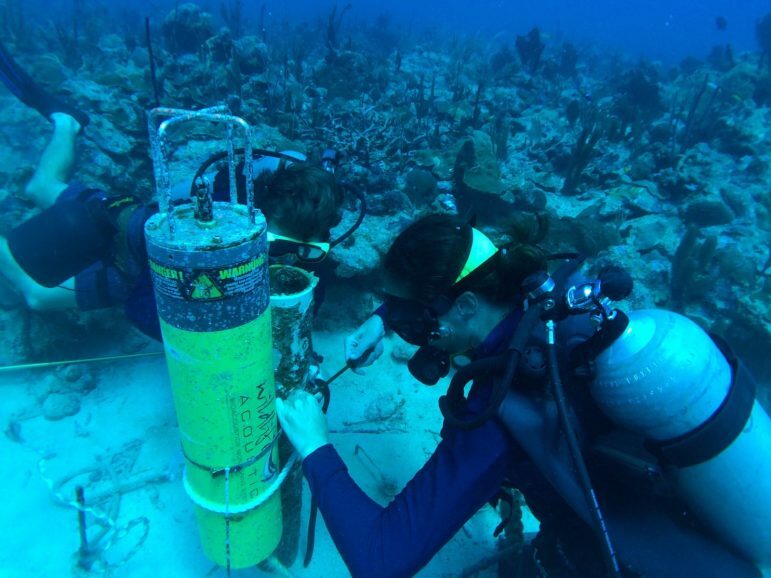 National Oceanic and Atmospheric Administration researchers in the agency’s Great Lakes office in Ann Arbor secured $60,000 to monitor reefs off the southern coast of Puerto Rico, in part to learn more about how they might be used in the Great Lakes. They placed three hydrophones in the water at different depths and left them recording for a full year. The devices missed the brunt of Hurricane Irma, which skirted the north side of the island, but were hit hard by Maria. “We were worried we were going to lose the hydrophones,” said Felix Martinez, a program manager for NOAA’s National Centers for Coastal Ocean Science in Ann Arbor. They were dislodged, but Puerto Rican researchers recovered them. Still, there’s been delays in finding out what they heard. With the city’s power grid crippled, the data couldn’t be sent to Indiana’s Purdue University for analysis, Martinez said. 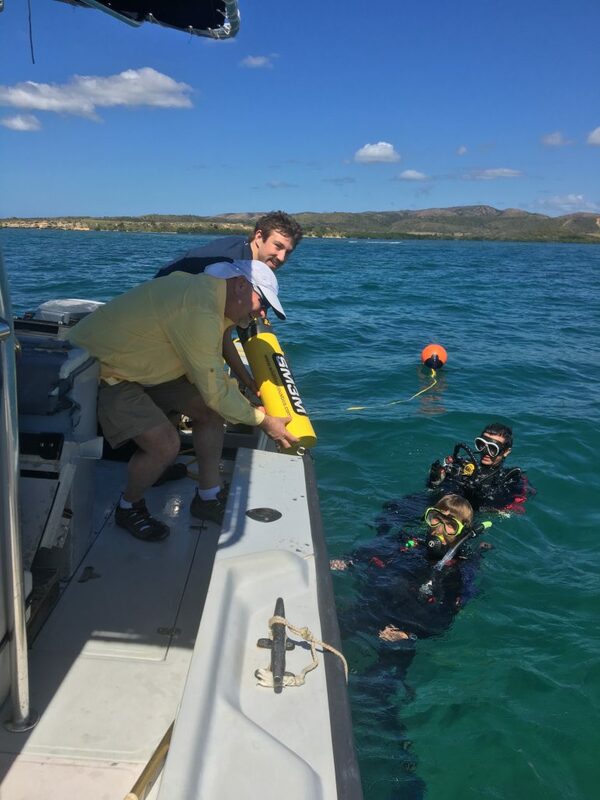 When one of the university’s graduate students flew from Puerto Rico to North Carolina, he brought hard drives containing a year’s worth of recordings from all three hydrophones–an enormous amount of data. Researchers from Purdue University and the University of Puerto Rico drop a hydrophone in for deployment. Image: Steve Ruberg, NOAA GLERL. The data still has to be copied before it’s shipped to Purdue for analysis. It’s exciting enough to hear what two hurricanes sound like passing over the reef, Martinez said. But this project is groundbreaking because it is the first to record continuously underwater for a year–similar to what he envisions could happen in the Great Lakes. “There’s a lot of questions that can be asked just using sound,” Martinez said. Some studies have used them to listen in on fish spawning. Recording sound could help scientists monitor fish populations, identify where they spawn and determine how man-made noise affects them, Martinez said. The recordings could allow scientists to count the fish that join in at the spawning ground, he said. Hydrophones are a good way to monitor fish and marine mammal populations without disturbing them, said Dennis Higgs, head of the Department of Biological Sciences at the University of Windsor. The Canadian government is expanding hydrophone programs to assess the effects of man-made noise, especially the noise caused by shipping traffic. Hydrophones will probably be used to monitor the environmental impacts of the upcoming construction of the Gordie Howe International Bridge, which will span the Detroit River, said Higgs. Hydrophone recording is more widespread in saltwater reefs, partially because they’re noisier, populated by loud species like snapping shrimp and parrot fish. Freshwater recording is just starting to catch up, Higgs said. The devices could monitor through the winter, long past the time when the ice cuts off access to divers, Martinez said. And even if it was possible, continuous monitoring by divers would cost millions of dollars each year. There are problems that would need to be worked out, he said. How would researchers sift through so much data? How do they interpret a noise they’ve never heard before? Researchers need to begin to collect sound libraries to help with identification. And more tests–like the one in Puerto Rico–have to run before scientists can figure out what is practical. This article has been changed to include the correct first name of Felix Martinez.